Divers are to search for a medal given to Cornish scientist Humphry Davy by Napoleon while France and Britain were at war. Davy's widow, Jane, is believed to have thrown the medal into the sea at Mounts Bay because it brought back memories of a dangerous voyage to collect it. When the couple arrived in France in 1813 they, and an assistant, were mistakenly arrested in Brittany. The Royal Society of Chemistry is arranging the archaeological dive. Spokesman Brian Emsley said the society would hire divers to help in the search for the medal, which could be in shallow waters. "It is really a long shot, but it is worth a try," he said. The dive search is expected to last three or four days. The society has offered a reward of £1,808 for the medal. 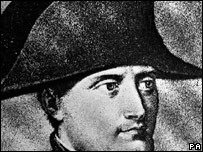 A letter dated 1808 said Napoleon's award was intended to "promote and share scientific knowledge". But the British naval blockade meant Davy did not receive the news for several years. In 1813, in the midst of the Napoleonic Wars, he made the journey across the Channel, but was arrested at Brittany after getting off a ship carrying prisoners-of-war from Plymouth. Davy, who was born in Penzance, was knighted in 1812 and made a baronet in 1818. He is best known for inventing the Davy safety lamp for miners.